Holiday apartment, close to the beach, with AC town of Dubrovnik price per day from £ 84 Book this remodelled and just recently furnished family apartment in the known tourist resort of Dubrovnik for complete relaxation and satisfaction throughout your summer vacations on Croatian coast. Entertainment and Sport: TV, Satellite television. General details: air conditioner, heating, fitness, terrace, balcony, parking. Apartment, close to the beach, with AC town of Dubrovnik price per day from £ 44 If you want to spend your vacation with your family members, book this apartment in Dubrovnik. Vacation apartment is located in a peaceful part of Dubrovnik with beautifully decorated rooms with lots of light, garden surrounded by greenery and flowers. Distance to the beach: 400 m. Entertainment and Outdoor activities: TV, Satellite television. Air-conditioned accommodation, 115 square meters town of Dubrovnik Spend your summer vacation in a beautiful house on the Croatian coast in this private apartment that is located just 400m from the breathtaking beach. Entertainment and Outdoor activities: TV, Satellite television. Distance to the beach: 400m. Distance to the ferryboat: 5km. Distance to the restaurant: 250m. Distance to the bar: 250m. Air-conditioned accommodation, max 4 persons, Dubrovnik town of Dubrovnik Beautifully decorated, comfortable and fully equipped apartment is situated in Dubrovnik. Enjoy a stroll around the city whose attractions will delight you. Entertainment and Sport: TV, Satellite television. General details: air conditioner, terrace, balcony, barbecue. Apartment, max 6 persons, Dubrovnik, Croatia town of Dubrovnik Luxuriously furnished apartment is situated in Dubrovnik. Completely furnished and effectively decorated apartment will ensure everything you need on your family trip. General details: air conditioner, hair dryer, garden, barbecue. Distance to the beach: 600m. Distance to the ferry: 2km. Air-conditioned accommodation, max 6 persons, Dubrovnik town of Dubrovnik If you wish to spend your vacations in Dubrovnik, then this accommodation is perfect for you. Kitchen details: oven, microwave, washing machine, coffee maker, toaster, ironing board. General details: air conditioner, garden, terrace, balcony, barbecue. Accommodation, max 12 persons town of Dubrovnik This Modern villa is perfect choice for a perfect holiday. Fully equipped and comfy they will ensure every little thing you need so you can fully dedicate enjoying in summer activities. Kitchen information: oven, microwave, washing machine, coffee maker, toaster, ironing board, ice maker. Entertainment and Outdoor activities: TV, Satellite television. Air-conditioned accommodation, max 10 persons, Dubrovnik town of Dubrovnik price per day from £ 182 If you wish to spend your getaways in Dubrovnik, then this accommodation is perfect for you. General details: air conditioner, fitness, hair dryer, garden, terrace, balcony, barbecue, parking. Entertainment and Sport: TV, Satellite television, radio. Air-conditioned accommodation, great guest reviews town of Dubrovnik The villa has a lovely and large terrace where you can enjoy sipping your morning a cup of coffee. Entertainment and Outdoor activities: TV, Satellite television. Distance to the ferryboat: 4km. Distance to the restaurant: 150m. Distance to the bar: 200m. Distance to the beach: 300m. Peaceful accommodation, 170 square meters town of Dubrovnik Book a convenient accommodation in Dubrovnik and spend your holiday near to the water and the attractive beaches. The vacation villa is entirely furnished and filled with light, and their covered terraces offer beautiful view of the sea. Entertainment and Outdoor activities: TV, Satellite television, CD player, radio. Distance to the ferryboat: 8km. Distance to the train: 80km. Distance to the beach: 7km. Guest house Maha town of Dubrovnik price per day from € 48 Bed and breakfast Maha is set in Dubrovnik. Sunny and airy rooms are fitted with wardrobe and fresh linen. Featuring a bath, shared toilet also comes with a hairdryer and free toiletries. Other amenities offered at the property include a tour desk. Personnel can assist with automobile rent and flight terminal shuttle at an extra charge. The guest house is 700 metres from Stradun, 800 metres from Walls of Dubrovnik and 500 metres from Minceta Tower. Guest house Mery town of Dubrovnik price per day from € 39 Close to the UNESCO-protected Dubrovnik Walls and only a 10-minute walk from the famous pebbly Banje Beach, Bed and breakfast Mery presents rooms and apartments with a back yard and a furnished patio. Free internet access and free car parking are provided. The Old City and Stradun Promenade with innumerable eating places, clubs and shops can be conveniently visited. A cable car ride providing breathtaking views of the historic centre and surrounding islands begins only 250 meters from the property. The Mary Guest House helps to organise daily trips and trips approximately Dubrovnik Riviera. Lumin guest house town of Dubrovnik price per day from € 36 Situated on the Stradun Promenade in the UNESCO-protected Old City of Dubrovnik, Lumin Bed and breakfast presents air-cooled rooms and gratis wireless internet throughout. Each room comes with soundproof windows, minibar, and a lcd tv. Private restrooms come with a hairdryer and free toiletries. The property is just steps away from museums, eating places and clubs. The distance to the Franciscan Abbey Dubrovnik measures 100 metres. Rooms Raič town of Dubrovnik price per day from € 51 Set only a 10-minute walk from Dubrovnik's Old City, the Raič presents rooms with an access to furnished terraces looking out over the town. Sandy, pebbly and rocky beaches are 500 metres away. Free internet access is available. All rooms come with air conditioning and satellite television. Hardwood floors with rugs and tiny seating area are provided. A well-equipped shared kitchen is available. The private toilet is equipped with shower and hairdryer. Visitors can enjoy a cable automobile ride, 500 metres from Rooms Raič, providing breathtaking views of Dubrovnik’s Old Town and surrounding islands. 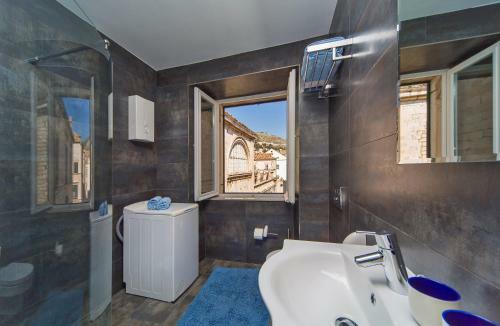 Studio Tamara town of Dubrovnik price per day from € 36 Studio Tamara is 700 metres from the closest beach and 1.2 km from the Old Town of Dubrovnik, which presents UNESCO-protected landmarks like the Onofrio's Fountain, Orlando's Column and Stradun promenade. It is air conditioned, has free internet access and a sea-view balcony. Flat-screen satellite television is provided in the apartment, whose well-equipped kitchenette includes a microwave and electric kettle. The toilet is equipped with a shower cabin and hairdryer. A bar, grocery shop, fruit store and a public bus stop can be found just 80 metres from the apartment. Dubrovnik-Apartments.co.uk offers a good selection of private accommodation in Dubrovnik for your perfect holiday. Apartments in Dubrovnik are the most suitable accommodation for families who would like private atmosphere on holidays in Dubrovnik, Croatia. Staying in an apartment you will have more freedom and more commodity than in a hotel. Book one of our authentic apartments from our offer in Dubrovnik and enjoy the spirit and uniqueness of the Mediterranean. Dubrovnik, Croatia is one of the most attractive and best known Mediterranean cities, with an outstanding historical and cultural heritage, and has been included in the UNESCO list of World Heritage Sites. The city has more than 250 sun days per year, with the average annual temperature being 17C. The average temperature during the winter months is 10 C, and the average summer temperature around 26C. Swimming season starts in April, and goes on until the beginning of October, or even longer if it's warm enough. In many luxury hotels, swimming is available throughout the year in covered swimming pools. You can find a great range of Dubrovnik apartments, villas, and rooms for those looking for an alternative to hotel accommodation. Due to magnificent views on medieval Dubrovnik, a walk along its ramparts is a must. In numerous restaurants and taverns, you may enjoy specialties of local as well as international cuisine. Accommodation in Dubrovnik spans everything from rooms,hostels, Dubrovnik apartments to hotels but the trend is clearly towards high-end accommodation. But if you are looking for cheap accommodation, locally run private accommodation in Dubrovnik can provide excellent value for money. If you can't find accommodation in the town of Dubrovnik, a string of small towns and villages south of Dubrovnik makes a good alternative accommodation choice, especially if you need to be close to the airport. For those who are keen on sports and recreation, there are courts and requisites for all kinds of sports in the sea and on the ground, from tennis and table tennis to sailing and yachting. There are also several fitness centers with swimming pools, saunas, massage, aerobics, solarium, box gyms, etc. Dubrovnik is famous for quality hotels and villas most of which are situated on the Lapad peninsula and in the area of Ploce, southeast of the Old Town. The vast majority of visitors stay on this Lapad peninsula which contains most of Dubrovnik apartments, hotels, and other private Dubrovnik accommodation. Here's where you'll be closest to Dubrovnik's largest beach. The hotel complex Dubrava - Babin Kuk on Lapad has all the features of a small town. It has a shopping center, bank, an out-patient department, many restaurants and coffee bars, and a street called the 'New Stradun', which connects all of the hotels. Dubrovnik is the city of an outstanding cultural and artistic life. The most important event is the Dubrovnik Summer Festival (July 10th - August 25th), traditionally held since 1950. It is a theater, music and folk festival, and since 1956, has been included in the calendar of world festivals, and as such, has become one of the most famous in the world. It takes place on open stages in the town (Gunduliceva Poljana, Drziceva Poljana, Lovrijenac, Revelin), or in beautiful interiors of its buildings (Duke's Palace, cloisters, churches). The repertoire includes works of Croatian and world classics, performed by the leading personalities from Croatia and abroad, including actors, directors, and conductors - several hundreds of which have performed in Dubrovnik so far. An important part of the Festival are performances of local (Lindo, Lado) and foreign folk music ensembles. The artistic life of Dubrovnik is characterized by exhibitions taking place throughout the year. The car-free island of Kolocep has some of the loveliest, sandy beaches in Croatia. Sunj beach on the island of Lopud - this beach is for those who prefer long sandy beaches. Banje - the most famous Dubrovnik beach. Beautiful pebble beach with a magnificent view to the Old town. Copacabana - pebble beach with some paved parts and the sea is shallow and perfect for families with small kids. If you are looking for private accommodation close to the Copacabana beach click here. Buza - beach on the stony slopes under the City walls. Sv. Jakov - attractive pebble and sandy beach with magnificent view on Dubrovnik and the Lokrum island. 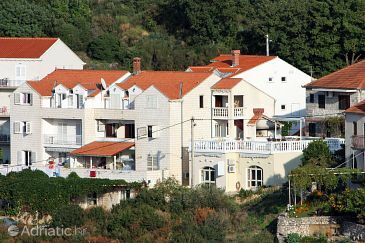 On this page, Dubrovnik-Apartments.co.uk has carefully selected a choice of hotels and apartments near Sv. Jakov beach. If you haven’t walked through the Stradun, you haven’t actually been to Dubrovnik – this is a famous saying related to this street, known amongst the people of Dubrovnik as Placa. Indeed, Stradun is the place you must pass to ‘feel’ the city and experience what it has to offer. This is a place to see and to be seen, even though but is hard to achieve during summer crowds. Stradun was constructed by filling the sea channel that separated first two settlements – Ragusa and Dubrava. This was done in the 10th or 11th century, which formed the city’s central street, 298 meters long to this day. The street was paved in stone in the 15th century, and major changes were introduced after the earthquake in 1667. Major part of the historic center, including the buildings on the Stradun, were ruined, thus major reconstruction was started. That’s way today the majority of the building are built in even baroque style. Stradun is surrounded by two famous fountains – on the western end is Big Onofrio Fountain and on the eastern Small Onofrio Fountain, and by two magnificent entrances to the city – Gate of Pile (western entrance) and Gate of Ploce (eastern entrance). Amongst already mentioned, along the Stradun, there are many famous city sights – from the Sponza Palace, the Church of Saint Blaise, Orlando Column and Bishop’s Court on the eastern part to the Franciscan monastery and the church on the western side. Most of the other famous sights such as the Cathedral or Ruder Boskovic Square, which are only few-minute walk away through the side streets. Therefore Stradun is an ideal choice if you stay in Dubrovnik for a (very) short time, considering the opportunity to see the majority of the sights an feel the spirit of the city. Stradun is also famous for hosting two of the most important events in Dubrovnik – The Saint Blaise Festival and the New Year Celebration. Therefore during the festival, a large procession is moving through the street, while on a New Year’s Eve there is held on of the best celebration in Croatia, with many famous singers performing. Beautiful Sponza Palace, built at the eastern end of Stradun, was one of the most important buildings in Dubrovnik throughout the history. The construction began in 1516 based on the blueprints by Paskoje Milicevic, and lasted for four years. Sponza was envisioned as a multifunctional object and served from the beginning as customs office and a warehouse, while inside there were mint and armory. Later, Divona became a home of the Academia dei Concordi, printing office and several schools. Before all that, Sponza Palace was the center of Dubrovnik’s trade. The development of trade caused the need for a new palace. Sponza Palace was built in Gothic and Renaissance style, which was characteristic for Dubrovnik at the time, but most of the similar objects were unfortunately ruined in the earthquake of 1667. Fortunately, Sponza survived the disaster and is now an excellent example of the construction of its time. Today it is still recognizable for its portico with arcades, and arcades are also located around the inner court, where trade was held back in the days. May is the most suitable month to take pleasure in the town as the residents do, without needing to squeeze your way down the slim back alleys and without sunshades covering the plazas. The top season runs from July through August, which is when the majority of tourists take their family holidays. All the things are in full speed: night clubs, resorts, dining establishments, apartments, hotels and dance clubs are humming, tourist facilities are working every day, and you'll discover outdoor performances, cultural events and cinema in the larger resorts. On the negative aspect, accommodation rates skyrocket (advanced reservations are advised), tourist attractions, beaches, and marinas are overcrowded, and noontime temperature levels exceed 30C. In September, the tide of travelers has mostly regressed leaving the hotels quieter, or even totally empty although you can still swim.October could be fantastic but could be rather a risk a regards climate and if the famous northern wind starts whirling. The period from late October to March is considered the low season and lots of facilities shut down entirely for the winter season. Apartment prices fall significantly, the dining establishments that are open are prepared to serve for residents instead of vacationers, and on bright mornings you can nevertheless take pleasure in coffee outside. As elsewhere in Croatia, many apartment owners in Dubrovnik expect you to stay for at least three nights and impose a reservation surcharge of at least 30% if you fall short. On-season you may be expected to stay for seven nights, especially in private accommodation / apartments.